Authorize.net is one of the original payment gateway providers. The number of merchants who still utilize their gateway services is impressive. Authorize.net however, has failed to keep up with recent technological advances and new, more efficient payment processing models. Fortunately, BlueSnap offers a smart Authorize.net alternative by providing a modern payment processing service approach that can dramatically improve customer experience while simplifying your payment operations. BlueSnap, a global payments solution, provides merchants like you with all the tools you need to create a beautiful, frictionless payment experience while dramatically simplifying (and, often reducing the costs of) your payment operations. RESTful APIs built to support mobile-first simplify the development of a beautiful, frictionless payments experience. Heavy investment in new technology to insure emerging payment types are supported; including emerging digital wallets such as Visa Checkout, Alipay and Apple Pay, Google Pay as well as Masterpass, PayPal and AMEX Checkout. BlueSnap will work with you to ensure simple onboarding, pricing transparency, and greater global support and emerging payment functionality – allowing you to capitalize on today’s eCommerce opportunities. Which Is the Better Choice for Your Business – BlueSnap or Authorize.net? Acquiring Banks for Local Payment Processing 30+ globally, included with your merchant account to increase transaction approval rates worldwide	 A unique contract and integration with each bank you connect to. Requires unique connections for each region. # of Currencies Accepted? 100 2 to 20 Depends on the bank you connect to. Reporting Sales Intelligence, Payment Conversion Reporting & Consolidated Reconciliation for all payment types & currencies / geo Limited Sales Intelligence and Reconciliation. Requires additional work to connect to Bank and Processor reporting. Rate 2.7% - negotiable for existing merchants The rate is determined by the Bank. In addition Authorize.net will charge a gateway fee. Typically an Invoice is difficult to interpret with multiple fees being applied to both the account and each transaction. The rate is determined by the Bank. In addition Authorize.net will charge a gateway fee. Per Transaction Fee $0.30 The rate is determined by the Bank. In addition Authorize.net will charge a gateway fee. Typically an Invoice is difficult to interpret with multiple fees being applied to both the account and each transaction. The rate is determined by the Bank. In addition Authorize.net will charge a gateway fee. As your business grows, you need the power of multiple bank connections to ensure you are maximizing payment conversions. BlueSnap’s Intelligent Payment Routing leverages multiple global banks to ensure that every transaction that can be approved, is approved. Authorize.net is limited to the single acquiring bank you separately select and manage. This traditional approach severely hampers your conversion opportunities and increases the likelihood of payment processing declines. BlueSnap’s All-in-One Payment Platform was designed to fight checkout abandonment and convert more shoppers to buyers, globally, which is why we also support payment processing in 100 currencies versus Authorize.net limited acquiring functionality. 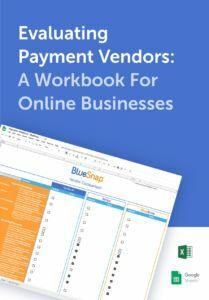 With alternative payments predicted to account for as much as 50% of eCommerce sales by 2020, BlueSnap accepts a host of payment types ranging from cards to ACH and local bank transfers as well as local eCommerce payment options including global wallets such as Visa Checkout, Masterpass, AMEX Express Checkout, Apple Pay, and Google Pay. Authorize.net (due to the competitive position of Visa – their parent) is not working to support all these emerging wallets – focusing rather on Visa Checkout and a few others. BlueSnap has invested heavily in developing a RESTful API that gives developers the control to build the right user experience while retaining the power and functionality of the Platform. The result is a world-class set of payment services accessible through an elegant API that allows you to design the best checkout experience for your business – on desktop, mobile and beyond to embedded payment experiences. With the All-in-One Payment Platform you get an elegant API to access the power of a global payments platform designed to solve checkout abandonment. The All-in-One Payment Platform can also support a full range of call center, email and invoice payments. Like Authorize.net, the Platform provides virtual terminal solutions and other must-haves for businesses who run online self-service checkout alongside customer-assisted sales. The All-in-One Payment Platform functionality allows for a simple transition from Authorize.net. BlueSnap offers recurring payment capabilities plus a full subscription engine for more complex requirements — something you won’t find with Authorize.net. BlueSnap, much like Authorize.net, is PCI Level 1 compliant. In addition, we offer tokenization and vaulting to add an extra layer of protection. A huge benefit that BlueSnap offers its merchants is full global merchant support. With support staff located around the world, we are always available and ready to assist you with your payment gateway and merchant account questions. At BlueSnap, we also offer the unique benefit of dedicated account management as well as consolidated reconciliation for all payment types and currencies. So, if you are looking for a strong Authorize.net alternative, consider BlueSnap. Contact us today to learn more.